What amazing weather in the northern hemisphere. It is just cold, so much snow, ice, cold rain and as Gattina said high humidity at around 99%. If I have to choose between heat and cold, I will go for the cold. That is Australian cold, not northern hemisphere cold. 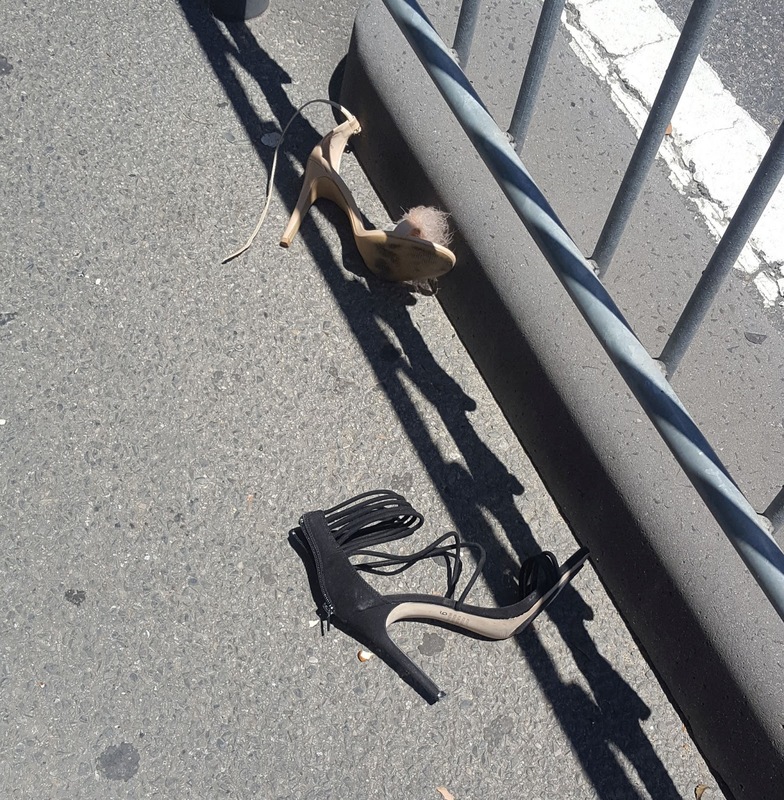 It was bloody hot here today. We were blasted by hot desert winds from inland Australia. Food shopping was done by 10.30 and once home we only stepped out onto the balcony a couple of times to just check that is was still hot, and tediously remark to each how hot it was. At 5:48pm, twelve minutes earlier than forecast (aren't we getting picky about weather forecasts), a southerly blast of cooler wind came through and blew off a number of old petals from the petunia. Lovely red blooms flew up into the air and on to who knows where. Now, it goes without saying that the US gets very cold in parts in the winter, but it is rather odd to me that in North Carolina, which is not that far north in the US, Sandra shows us photos of frozen fountains, (something has gone wrong here. Just Google frozen fountains North Carolina) and in South Carolina, Jennifer is feeling very housebound by snow and bad weather. Well not really, not accommodating him. Using the first initial of his name will confuse you, as it is R, so let's just call him T for tram fan. T lives in Surfers Paradise in Queensland. He was once an employee in Melbourne's public transport system. Public transport fans, especially for trams, are known at times as gunzels. Don't ask me why. I think the far more derogatory term 'foamers', who foam at the mouth at seeing seeing something transport related is kind of self explanatory. The week past has been crazy busy, but after moving a meet up with T about three times, we met up at Flinders Street Station at about 9.20am. On the platform was my workplace cleaner, who has moved on to a supervisory role, and parted from my workplace. Con must be about 60, and it is clearly visible that he once very handsome bloke of Greek heritage. I wished him happy 2018 and shook his hand as we left the train. He was going on to Essendon, while T and I caught the same 9.32 train to Moonee Ponds. I had looked in advance at the PTV website for the right train to be at Moonee Ponds Junction by 10am. Yes, the 9.32 will suit me well. T caught the same train so it did not really matter about being at Moonee Ponds Junction by ten. We strolled from the station along Puckle Street to the Junction where we examined how the tram system worked there. It is a bit complicated as is it the terminus for the route 82 Moonee Ponds tram to Footscray, and a through point for the route 59 tram to Airport West. Why is there a route 57, a West Maribyrnong tram here? We worked out that it had run out from the depot and this was the way it went into service on route 57. There was what appeared to be a good bus interchange there too. It is quite a public transport hub, and I am pleased we had a good look at it. We caught the 82 to Footscray, with much figurative Oh My God exclamations. I remember this was all paddocks, now blocks of flats. This was undeveloped, now all shops. I recognised one spot, from when we visited Jack's Magazine. It was where we had a nice lunch. We entered Footscray Station via the new entrance, which does not really sit well with the old still existent station. T used the stairs as climbing stairs help his bad knee. I used an escalator which helps with my bad back, that is just stand there. There are plenty of trains at Footscray Station to get back to town. I chose the limited express, which skips one station. T and I parted ways at Flinders Street Station, he heading for St Kilda Road trams back to his digs in St Kilda, and me to the DeGraves Street subway (an underpass) to get a couple of things at the Woolworths Metro supermarket in Flinders Street. It was a bit of fun catching up with him. He is also gay, so the chat wasn't all about trains and trams. I hate catching an outbound tram at Flinders Street Station, so I walked up DeGraves Street to Flinders Lane and then to the Collins Street tram stop for a tram home. Once on the tram, I texted R; on a tram home, see you soon. He called me back, at Chemist Warehouse in town and about to have brunch. I hopped off the tram and crossed and caught one up to Bourke Street where we had brunch. We caught the tram home and who should be filming at our tramstop? Yes, T. I introduced R to T, which will make things a whole lot easier in the future should we visit Surfers Paradise again. Did I take photos? Only a couple. I was early to get to Flinders Street Station, so I left the tram at the Arts Centre and walked across Princes Bridge. I remember when the late former State Arts Minister Lynne Kosky announced a plan to link the lower area behind the gallery with the St Kilda Road level by cutting away this embankment. I guess the project was never funded. I wonder how far the planning went. The merit of this sculpture is doubtful in my opinion but children just love playing around them. Simple fun. It is bit like the many many presents Little M and Little Em received at Christmas. After initial toy inspections, they preferred to play with cubes of ice from two drink eskies for the next hour. We seem to have a pop up pontoon restaurant on the Yarra River. It is part of Abory, a nearby bankside restaurant and bar that now occupies a space next to where there was once a train platform. It looks nice but I bet it is very expensive. For my male readers, or even female, turn you mind back to when you were 16 or 17. Would you have kicked a policeman in the face when trying to stop a shoplifting teenager mate from being arrested? I will guess your answer will be no. The instance above refers to northern African immigrants, or those who have parents were African immigrants. But that is not particularly relevant as we also hear of young white multi generational Australian youth doing the same. A couple of white female tourists are charged with assaulting police at a Sydney beach Christmas Day party. I consulted with my English born better half, and he agrees that when we were young, we were frightened of policemen, and it was men then. If we behaved badly, the threat was always there that a policeman would come and take us away and do goodness knows what to us. Of course as an adult, there is some appeal in a policeman doing goodness knows what to me. So how has the change in society come about? Perhaps in summary, little respect for authority, leading to those in authority to not have authority any more. Is there any validity in saying, they need a good kick up the arse? The police were just the people to do that, and they did. Is that where the fear and respect came from? They were never supposed to do that, but a blind eye was turned. Of course given the power of assault being ignored, it led to abuse of power. One possible reason I have touched on before. If people are not picked up by police for minor matters, they will lose respect for laws and the enforcement of them. Is it that institutions, including police, around the world have been exposed as being very corrupt in the twentieth century? Ok, generally police no longer give an arse kicking to a badly behaving youth, but there are other things to fear from getting involved with police, such as being locked up for an extended period, the shame, the pointlessness, the criminal record, the fact that you are a marked person by police. I just do not understand why there is no fear of the police, the courts and the legal system. Is it that the courts are too lenient? Many people say yes, but if they sit in on a trial, they say no. The judgement and sentence were fair. Oh well, hopefully me pontificating from my ivory concrete tower will not experience some of the terrible crimes in Melbourne that have been perpetrated on those similar to me, very very normal people. Later edit: It seems like the cop kicking kid has breached many orders, including bail and parole and a criminal history and will now be remanded in custody. Points to you if you know who Miss Millicent Friendly is without Googling. It could as easily be Mrs Murgatroyd McConachy of Upper Kombuctor West. More points if you know about that town. I mucked up this time and I don't normally fall for such promotions. Here is why. This was a good deal, a roll of aluminium foil in a reusable plastic dispenser. The brand is Multix, a big and well known company. A little research tells me it is owned by a larger company called McPhersons, which has fingers in many pies, here in Australia, across the waters to New Zealand and in Asia. A snip from their website. McPherson’s, established in 1860, is a leading supplier of health, beauty, household, personal care and home appliance products in Australasia, with operations in Australia, New Zealand and Asia. The Health, Wellness & Beauty division markets and distributes beauty care, hair care, skin care and fragrance product ranges, kitchen essentials such as baking paper, cling wrap and aluminium foil, and personal care items such as facial wipes, cotton pads and foot comfort products. The Home Appliances division markets and distributes large appliances such as ovens, cooktops, washing machines and dishwashers. In addition, by managing and representing major international brands together with retailers’ private labels, we are able to provide retail customers with a one-source opportunity for complete category management from product innovation and range development to a menu of how the ranges are delivered and managed in-store. McPherson’s manages some significant brands for overseas agency partners such as Gucci and Hugo Boss prestige fragrances and Trilogy skincare; however, the majority of revenue is derived from the company’s diversified portfolio of owned market-leading brands, including Manicare, Lady Jayne, Dr. LeWinn’s, A'kin, Swisspers, Moosehead, Maseur, Multix, Euromaid and Baumatic. McPherson’s has a large customer base, servicing approximately 10,000 retail outlets, most of the region’s leading retailers, including supermarkets, discount department stores, department stores, pharmacies and independent housewares stores. I have not sent my complaint email to the company, yet. A picture saves many words. Now, when after a year the foil runs out, you would think you were safe in buying the same brand of foil to fit into the plastic dispenser? Yes? No! Note the widths of the new roll and the older dispenser. The 30cm wide roll will not fit into the 29.6cm dispenser. If you are unmetricated, that is less than 1/4 of an inch. I have sent the complaint now. About a year ago we bought a promoted special at a Coles supermarket, a roll of Multix Alfoil in a reusable plastic dispenser. I hate it when a box starts to disintegrate before the roll of whatever runs out. The foil ran out and so we bought a new roll of Multix Alfoil and it does not fit the dispenser. Looking more closely, the dispenser is for a 29.6cm wide roll and the roll we bought is 30cm. Of course we can't return it to the supermarket as the box has been opened. I can only say we feel very cheated and I ask, if you were buying the same brand and same length replacement roll for a dispenser, would you check the width? Is a 29.6cm roll still available? Miss Millencent Friendly was a character in a board game called Art Auction. I always selected her character. Upper Kombuctor West was a fictional town in a variety show where lived......an old lady. I can't remember now. I received this reply the following day. The refill pack was produced specifically to fit the dispenser pack. Yes, again bumped to Tuesday. The Easybeats were an Australian group and two of the members were Harry Vanda and George Young. George recently died, I think I saw on the evening news. They went on to be music producers in London and pumped out Kylie Minogue hits one after another, along with music and lyrics for many other artists. They wrote and recorded Friday on my Mind as The Beach Boys, but how much better did David Bowie perform the quite wonderful song. Well, that is my opinion. You may disagree and I will think no less of you. The lead singer is rather cute in the Easybeats version. Oh, he is dead, Stevie Wright, of Evie fame. Would you believe we heard that just today, as I am writing this, blaring out from a car in Flinders Lane in town. Ok, you are all going to say you prefer the original version. Screw you. I reckon I have I have it right for next week's post though, and I have thought of another song that is contentious, original or cover. A couple of years ago we saw Niagara Falls. It was hot and humid and the cooling mist of water from the falls was most welcome. 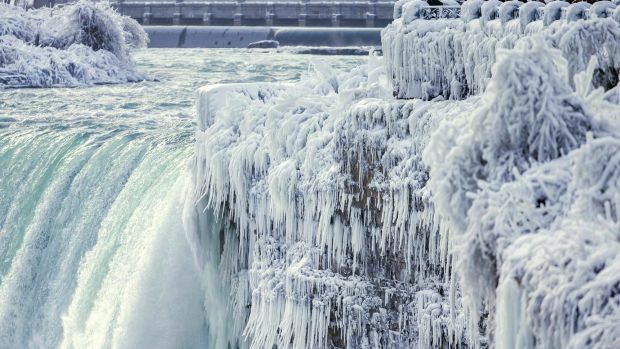 How can it be that Niagara Falls is now like this? Photo by Muhammad Lila. And they cost how much? We had two terrific holidays this year, one in Sydney, but especially our European cruise where we began with a couple of days respectively in Dubai, Lisbon, Porto and Barcelona where we were joined by R's English sister and brother in law for a cruise of the Mediterranean. We visited Pisa, Marseille, Olympia, Naples, Mykonos, Santorini and the most surprising place which we all loved, Montenegro. Holidays in 2018 will be rather more tame. We are getting old and saving ourselves and money for a big trip to the UK in 2019. As we have both discovered this year, physically getting old is not a lot of fun but mentally, we don't mind at all. Friends too are having their own medical issues, and we rather miss our dyke friend who moved to Launceston in her home state of Tasmania with Dog Jack. Around home not a lot was done. The bathrooms are on the list this year, but then they were in 2017 too. We'll get there. Around the world and here in Melbourne, some rather nasty stuff has happened in public spaces. But the odds of you being a victim are very low. Nevertheless, when we took Little Jo into town earlier this week, I was hypervigilant, not just checking for cars when we crossing streets, but checking streets themselves. Sad really. We so much enjoyed family time, especially at the wonderful country wedding of our nephew. Sister and Bone Doctor are to be married in 2018, along with our oldest niece to her partner. That Little Jo's mums can get married was somewhat a highlight of the year, even if the process was not. The delightful twins were born to the middle niece, and there were issues but things seem ok now. Mother and her house electric wringing caused us a lot of stress and cost. She is becoming increasingly frail, but still sharp as a tack. Yeah, it was not a bad year really and I continue to treasure the online company of my blog mates. My very best wishes to you for 2018. I worked this NYE until 6:30pm and I start work New Year's Day at 8:30am, so it is a quiet NYE for us, and I will well and truly be in bed at midnight. But what if we wanted to go into to town to enjoy the festivities and 14 tonnes of fireworks? Well, it would be Shank's pony for us, in spite of having a tram normally go past our place every few minutes in the evening. For some reason Yarra Trams is stopping trams at Domain Interchange this year. I don't know if it is its doing or the police and the state government on security grounds. If it is the doing of Yarra Trams, it is a disgrace. Thousands of people would normally use trams to get to the city. They now face a twenty minute brisk walk. It would be a twenty six minute walk for us. In spite of good advance publicity, still there will be heaps of old people and people with very young children expecting to at least travel by tram as far as the Arts Centre. How can we get to town? Neither of us at the moment capable of such a walk, and then the return walk home. We can walk for about ten minutes to a tram stop in Toorak Road and catch the tram to South Yarra Station and then catch a train to the city. For whatever reason, I am astonished that Yarra Trams cannot deliver us to at least the edge of the city on this New Year's Eve. Finishing 2017 with a whinge, and I promise I won't whinge until at least the 2nd of January. As I have said in the past, I do like a good funicular. But I haven't shown you a funicular for a while. It must be time for you to enjoy a good funicular. At our ages, a funicular once or twice a year is not a bad thing. 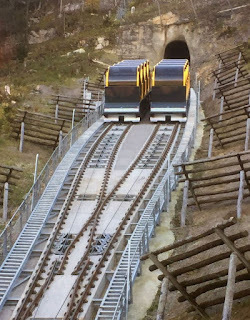 This one minute video is a very modern funicular, replacing an old one somewhere in Switzerland. Ok, Stoos, if you must know. The video is quite self explanatory. Interesting that each carriage rotates according to the steepness of the ascent or descent. From the Youtube videos I watched, it looked awfully like a very steep rail line. I was all primed to say that it was not a funicular, but I know to research carefully before opening my gob, well mostly. I then came across this photo, which does rather prove it is a funicular. One goes up as the other goes down, counterweighting each other, meaning less power is needed. Then someone in the Youtube comments challenged 'the world's steepest funicular', saying the world's steepest funicular is just out of Sydney in Australia. I straight away knew what the person was referring to, as we have travelled on it. I think it was built a century or more ago, to transport coal? equipment? up and down the side of what is pretty well a treeded cliff. It has been reinvented as a very popular tourist attraction in New South Wales' Blue Mountains. It has claimed the steepest incline railway in the world, but so have many others. The inconclusive research was quite an educational experience. Here is a clip of the Blue Mountains incline railway, but it is not a funicular. I love the thrill of the woman in the clip, and what views near the end of the two minute clip.